Thinking about whitening your teeth? With today’s advances in cosmetic dentistry, there’s never been a better, or less painful, time to brighten up your smile game. Plus whiter teeth can take years off your appearance.Teeth get discolored because of things like smoking, coffee, tea, berries, and red wine, but lucky for you most stains can be removed with an at-home or in-office tooth whitening procedure. I talked to two renown dentists to learn the low-down on the best at-home and in-office tooth whitening procedures. While their are a lot of different product names and formats, most at-home (and in office) dental whitening treatments use hydrogen peroxide as a whitener. ”Hydrogen and peroxide are the two active ingredients used to whiten teeth. These are present in both in-office and at-home whitening treatments,” says Dr. Victoria Veytsman, Cosmetic Dentist and RealSelf contributor. Some guys might prefer a more do-it-yourself approach to tooth whitening. Veytsman explains, ”For maintenance, natural remedies can good. A lot of my patients like coconut oil pulling, although there is little scientific evidence to support it. A good DIY at home could be mixing a small amount of hydrogen peroxide with water and baking soda. Using this mix occasionally can help. 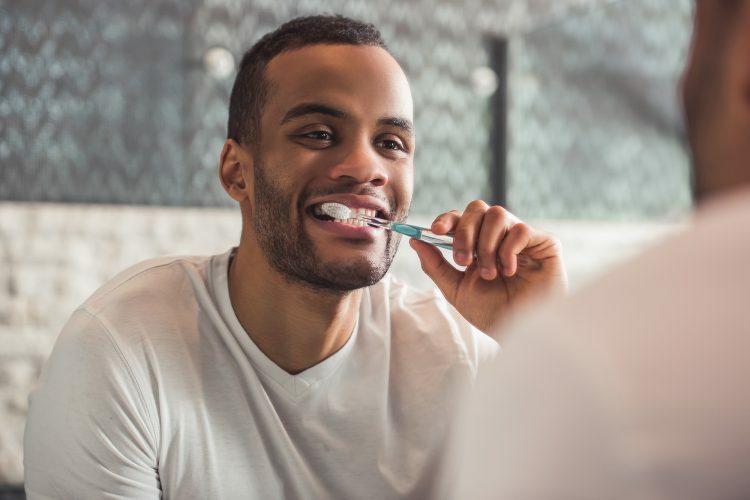 Diet plays a big role too — crunchy healthy things like apples can help remove stains.” While it’s a popular trend, beware of brushing activated charcoal directly on the teeth. It can strip the tooth enamel if not properly formulated. “A very popular in-office procedure is called Zoom Whitening. It’s what I use on myself and my patients—I’ve done literally hundreds and hundreds of them,” says Veytsman. ”It’s the quickest, most conservative thing you can do to improve your smile for an instant boost. You can get anywhere from 3-7 shades lighter depending on where you are starting. It utilizes hydrogen peroxide which just oxidizes stains off he enamel with no damage. What about if you want something more dramatic, without the long time delay and hassle of gradual whitening? Enter dental veneers. “While whitening is the quickest thing you can do I definitely recommend a Smile Makeovers before a big event,” says Veytsman. “This could as few as 4 Veneers on the top teeth and some whitening to a full set of upper and lower veneers. Veneers obviously will result in the most dramatic difference. This is for people that seriously want to pop on the red carpet or on stage. We can change the color size and shape of teeth and really accentuate the whole face. Sometimes we’ll do something simple like bonding and re-contouring where we can fix minor chipping and unevenness. That has a very nice impact too. It’s amazing how a combination of small tweaks and changes can yield big overall results. There’s a huge anti-aging component to teeth whitening. Everyone is chasing youth in this millennial culture. Luckily with cosmetic dentistry, it becomes accessible. Frequent Flyers, What’s in Your Travel Toiletry Bag?